Understanding the genetic basis of adaptive traits is an important goal in ecology and evolutionary biology. Variation in gene expression is believed to underlie much of the phenotypic diversity within a species [1–3]. However, most of the adaptive mutations identified until now are in coding sequences [4–6]. The reason for this is that protein variants are easier to identify because the genetic code enables in silico prediction of causative mutations. The contribution of changes in gene regulation to phenotypic diversity and the mechanisms underlying these changes merit further investigation. Mutations outside of coding regions can lead to alterations in transcription, splicing, transcript stability, or chromatin remodeling and consequently can affect the regulation of gene expression [6–8]. Modifications in cis-regulatory sequences, such as single nucleotide polymorphisms (SNPs) and indels, can affect their expression and are thought to be targets of evolution [9–14]. Additionally, insertions of transposable elements inside or outside the promoters may introduce elements that enhance or repress transcription and induce changes in the chromatin state of adjacent regions, thus altering the expression of nearby genes [15–21]. Thus, transposable element insertions have the potential to contribute to phenotypic diversity through chromatin remodeling and regulation of gene expression. In fungi, rapidly evolving regions, which frequently contain genes involved in virulence and stress tolerance, are often associated with transposable elements . The contributions of transposable elements to evolution of adjacent regions and their effects on fungal diversity are frequently postulated [22–24] but have rarely been demonstrated. Many fungal plant pathogens are broadly distributed across the globe and are exposed to constantly fluctuating climatic conditions, a wide range of fungicides, and host immune defenses which can vary according to the host plant genotype [25, 26]. Adaptation to changing environments typically favors the capacity to respond rapidly to stress. Additionally, populations that maintain a high standing genetic variation for adaptive traits are typically more successful in surviving in changing environments . One such adaptive trait is melanization. Melanin is a broadly distributed secondary metabolite required by many fungi for host colonization and survival under stress conditions [28–31]. Two major types of melanin have been extensively described in fungi, namely dihydroxynaphthalene (DHN) and dihydroxyphenylalanine melanin [32–34]. A high diversity in melanin accumulation among individuals within a species provides a mechanism for differential tolerance to rapidly changing and locally hazardous conditions . Zymoseptoria tritici is a major wheat pathogen that has been extensively investigated for its potential to colonize different wheat cultivars and survive under stressful conditions, including exposure to high temperatures and fungicides [33, 35–37]. 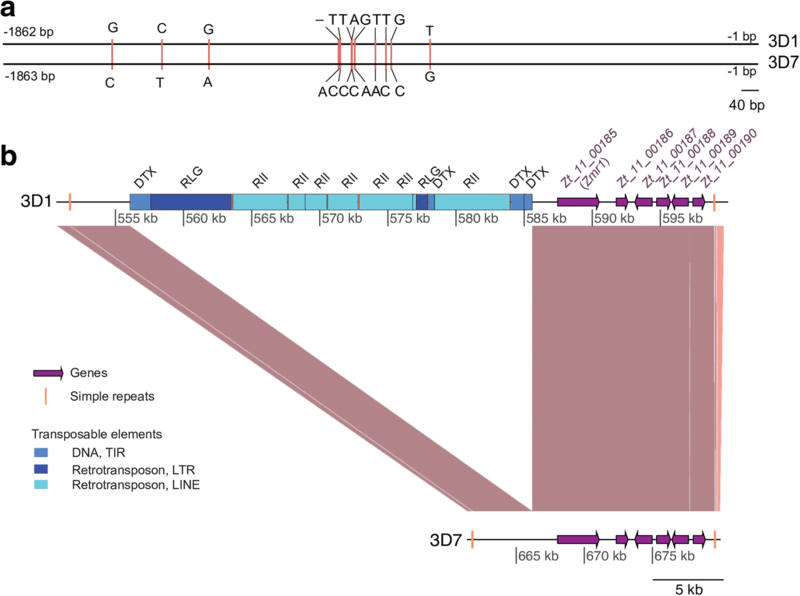 Z. tritici is known to have a plastic genome that includes numerous transposable element insertions (17% of the genome) and in which chromosomal rearrangements frequently occur [36, 38, 39]. It is thought that this genome plasticity can make important contributions to phenotypic variability, but the precise mechanisms underlying this phenomenon are not fully understood [36, 37, 40]. In four Swiss strains of Z. tritici, variable levels of melanin accumulation were observed and were postulated to contribute to differences in tolerance against abiotic stress, including fungicide resistance [33, 41]. We aimed to further explore the genetic basis of differences in melanin accumulation by using a previously performed genetic mapping approach . 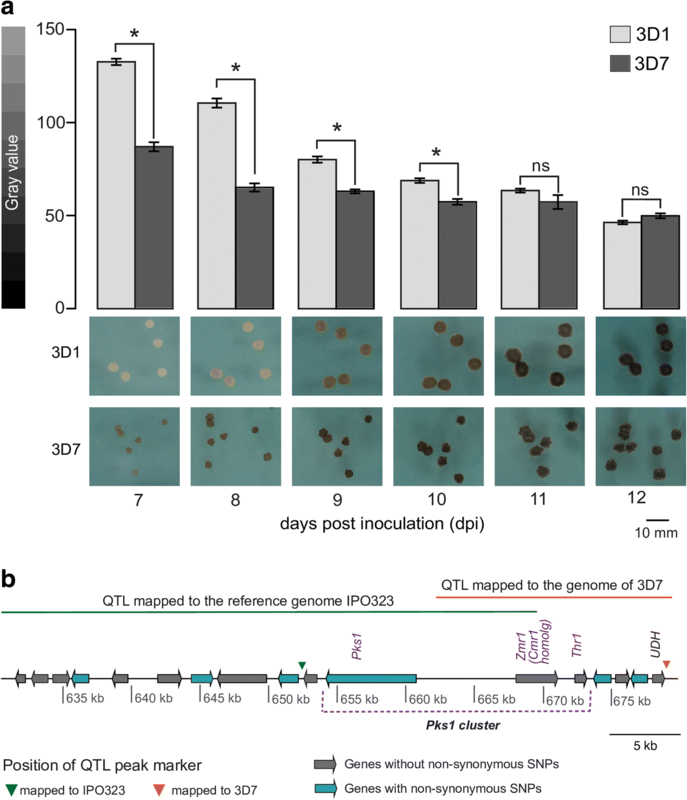 A single quantitative trait locus (QTL) was identified that contained part of the polyketide synthase 1 (Pks1) gene cluster, which is involved in biosynthesis of DHN melanin in other fungal species [32, 34, 42, 43]. In this work, we remapped the QTL to the genome of one of the parental strains and we obtained a narrower and shifted QTL confidence interval, which allowed us to determine the genetic basis of the differences in melanin accumulation. We show that variation in gene expression, instead of variation in the coding sequence, underlies the observed differences in melanin accumulation. Variation in expression of a single gene, encoding the homolog of the transcription factor Cmr1 (Colletotrichum melanin regulation 1), which we named Zmr1 (for Zymoseptoria melanin regulation 1), explained the variation in melanization. We discovered two independent causes of variation in gene expression, namely SNPs in the promoter of Zmr1 and an insertion of transposable elements upstream of the Zmr1 promoter. We then showed that diversity in melanin accumulation at the species level is determined in part by independent insertions of transposable elements, which regulate Zmr1 expression. We showed that melanin has a deleterious effect when the fungus is grown under optimal conditions but is beneficial in the presence of fungicides. We hypothesize that the complex regulation of Zmr1 facilitates the emergence and maintenance of diversity in melanization to optimize a trade-off between the deleterious effect of melanin on the growth rate and its favorable effects on survival in stressful environments. Melanin accumulation in the Swiss Z. tritici strain 3D1 was lower than that in the strain 3D7 at early time points (10 days post inoculation, dpi). The differences in melanization were temporal, as the lighter strain 3D1 accumulated similar amounts of melanin as 3D7 at later developmental stages (11–12 dpi; Fig. 1a, Additional file 1). We explored the genetic basis of these differences in melanin accumulation by using the previously obtained QTL for these two strains . To narrow down the confidence interval, a new genetic map was obtained by using the completely assembled genome of the parental strain 3D7  instead of the genome of the reference strain IPO323. This strategy provided us with approximately 10 times more SNP markers and enabled us to identify additional crossover events. The newly mapped 95% confidence interval of the melanization QTL was narrowed from 43429 to 18135 bp and contained six genes instead of 12. The new QTL position shifted with respect to the earlier position, with an overlapping region of only 9299 bp. The region shared between the two QTLs contained the promoter of a gene encoding the homolog of the transcription factor Cmr1 (Colletotrichum melanin regulation 1), which we named Zmr1 (for Zymoseptoria melanin regulation 1). Two of the genes within the new confidence interval belonged to the Pks1 cluster, namely Zmr1 and 1,3,8-trihydroxynaphthalene reductase (Thr1, Fig. 1b, Additional files 2 and 3). The most obvious candidate genes to explain differential melanin accumulation in the two parental strains were Zmr1 and Thr1. Both encoded proteins were identical between the parental strains (Additional file 3) and no mutations were detected in the promoter (1000 bp upstream of the start codon) of Thr1. However, 12 SNPs were identified in the promoter of Zmr1 (Fig. 2a) and we hypothesized that these SNPs could explain the differences in melanization. A comparison of the parental genomes revealed a loss of synteny in the QTL. We found an insertion of a transposable element island of approximately 30 kb, located 1862 bp upstream of the Zmr1 start codon, only in the lighter strain 3D1 (Fig. 2b). The sequences adjacent to the transposable element island, including the full Pks1 gene cluster, showed a high conservation of synteny between the two parental genomes. The transposable element island consisted of 13 transposable elements and possessed both DNA transposons (of the TIR order) and retro-transposons (of the LTR and LINE orders) interspersed by simple repeats (Fig. 2b). We hypothesized that changes in non-coding regions could underlie natural variation in levels of melanization. Transposable element insertions upstream of the promoter and/or mutations in the promoter could lead to differential regulation of the genes in the Pks1 gene cluster and, consequently, to different levels of melanin synthesis and accumulation. We found that Zmr1 expression was higher in the darker strain 3D7 than in the lighter strain 3D1 at a time point when differences in melanin accumulation were detected (7 dpi). No significant differences in expression levels were observed at a later developmental stage (9 dpi), when the degree of melanization in 3D1 was higher (Fig. 3, Additional file 4). Thus, we postulated that differential regulation of Zmr1 expression, potentially mediated by differences in non-coding sequences, could underlie differences in this adaptive trait. To determine the role of Zmr1 in melanin accumulation in Z. tritici, we generated Zmr1 knockout mutants by homologous recombination in strains 3D1 and 3D7 (Δzmr1). No melanin accumulation was observed in Δzmr1 mutant colonies grown in vitro or in pycnidia formed on wheat leaves in both genetic backgrounds (Additional file 5), confirming that Zmr1 is required for melanin biosynthesis in Z. tritici. We further explored the function of the transcription factor Zmr1 in regulation of gene expression by pursuing a comparative transcriptomic analysis of the wild-type strains and the Δzmr1 mutants, in both 3D1 and 3D7 backgrounds. Twelve genes were downregulated in both Δzmr1 mutants (Table 1, Additional file 6). The expression levels of all the genes described to be involved in the DHN melanin biosynthetic pathway were significantly reduced. Remarkably, the expression of Pks1 and Thr1 was nearly abolished in the mutants (Table 1, Additional files 5 and 6). Transcriptomic profiling corroborated the hypothesis that Zmr1 is a major regulator of the genes involved in the DHN melanin biosynthetic pathway. We showed that DHN melanin is the only type of melanin accumulated in in vitro grown colonies and in Z. tritici pycnidia produced in planta. Log2 fold change (log2 FC) expression values (counts per million mapped) of genes significantly downregulated (Benjamin-Hochberg false discovery rates (FDR) ≤ 0.05 and adjusted p value ≤ 0.05) in both 3D1Δzmr1 and 3D7Δzmr1, compared to their respective wild-type. In bold are genes already described to be involved in the DHN melanin pathway in other fungal species. We next postulated that the basis of the differential accumulation of melanin in 3D1 and 3D7 is the differential expression of Zmr1 (Fig. 3), which could potentially be caused by modifications in the promoter or by the transposable element insertion (Fig. 2). The contribution of promoter modifications to Zmr1 expression was evaluated by analyzing allele replacement lines in the 3D7 background. Increased melanization was achieved by in locus expression of both 3D1 and 3D7 Zmr1 alleles in 3D7Δzmr1 (3D7Δzmr1 + Zmr13D1, 3D7Δzmr1 + Zmr13D7) compared to the knockout, confirming the role of Zmr1 in melanin biosynthesis in Z. tritici. Remarkably, although the 3D7 allele fully complemented the knockout phenotype, in locus expression of the 3D1 allele led to an intermediate phenotype between the knockout and the wild-type (Fig. 4, Additional file 7), suggesting that differential accumulation of melanin is caused by SNPs in the Zmr1 promoter. We investigated whether the transposable element insertion in the lighter strain 3D1 modulated Zmr1 expression. We made use of Δzmr1 mutants of both 3D1 and 3D7, in which the Zmr1 gene was disrupted by a hygromycin resistance cassette under the control of a constitutive promoter and of the ectopic controls, in which the hygromycin resistance cassette did not disrupt the Zmr1 gene but was inserted elsewhere in the genome (Fig. 5a, c). In the 3D7 background, the knockouts and the ectopic lines displayed similar growth in the presence of hygromycin (Fig. 5b). Remarkably, we observed that growth of all three independent Δzmr1 knockouts in the 3D1 background was lower than growth of the ectopic transformants in hygromycin-containing medium (Fig. 5d). Hence, we hypothesized that the transposable element cluster silenced the expression of the hygromycin resistance gene, with the observed phenotype in the mutant likely reflecting the contribution of the transposable element insertion to Zmr1 expression regulation. To confirm the role of transposable elements in downregulating Zmr1 expression, attempts were made to generate in locus complementation or allele replacement transformant lines of 3D1Δzmr1. However, no successful transformants were obtained. Instead, we replaced the entire transposable element island (30 kb) with a hygromycin resistance cassette. Three independent knockout lines (ΔTE) of the transposable element insertions were obtained and analyzed for melanin accumulation in vitro at 7 dpi. The transposable element deletion mutants were much darker than the wild-type 3D1 (Fig. 6a, Additional file 8). Furthermore, expression levels of Zmr1 in the transposable element knockouts were significantly higher than those in the wild-type 3D1 (Fig. 6b). Overall, these results demonstrate that the transposable element island upstream of Zmr1 in the less melanized strain negatively regulates gene expression and contributes to the variability in melanin accumulation between the two strains. We observed that the non-melanized mutants grew faster than the corresponding wild-types (Fig. 7a, b, Additional files 9 and 10). The growth rates of melanized 3D1 and 3D7 were, respectively, 61 and 34% lower than those in non-melanized mutants, suggesting that melanin production has a fitness cost for Z. tritici. We aimed to explore possible biological roles for melanin in Z. tritici. Virulence of a non-melanized mutant was not altered compared to the wild-type strain after 21 days of infection in wheat plants (Additional files 11 and 12). Furthermore, pycnidiospores produced under controlled greenhouse conditions in the albino pycnidia of Δzmr1 were fully viable. Thus, we found no evidence that melanin plays a role in host colonization or pathogen reproduction. To evaluate the role of melanin in fungicide sensitivity, we grew the wild-type 3D7 and the non-melanized mutant 3D7Δzmr1 colonies in rich media until 3D7 was melanized (5 dpi) and then we treated the colonies with the succinate dehydrogenase inhibitor (SDHI) fungicide bixafen. 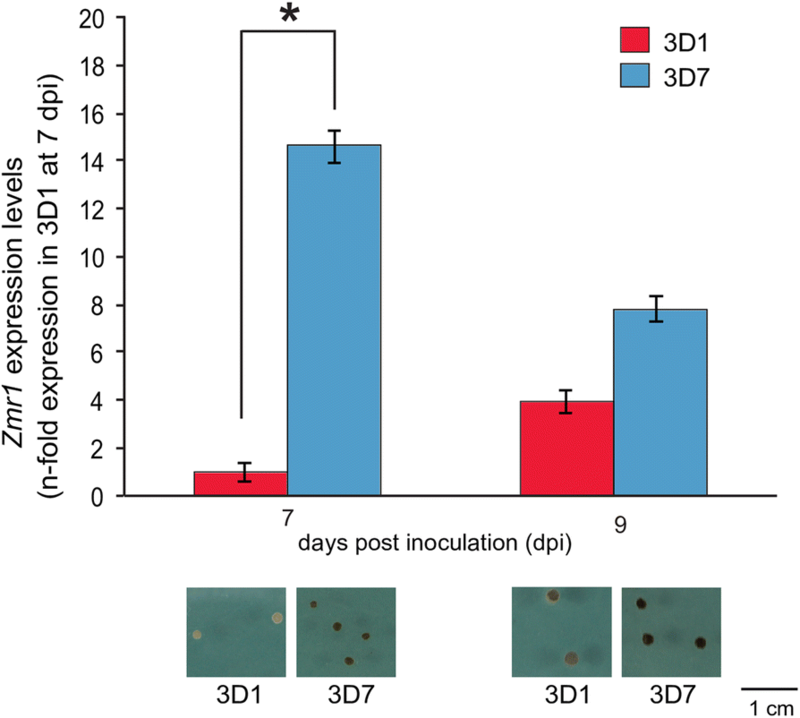 The decrease in growth in the presence of the fungicide of the non-melanized mutant 3D7Δzmr1 was higher than that of the wild-type 3D7, indicating that melanin lowers the sensitivity of Z. tritici to bixafen (Fig. 7c, Additional file 13). However, the non-melanized mutant was not more sensitive to the azole fungicide propiconazole than the wild-type (Additional file 13). These data demonstrate that melanin can specifically protect Z. tritici against SDHI fungicides, but its production has a negative effect on growth. We propose that modulation of Zmr1 expression potentially balances its beneficial functions against the growth costs associated with melanin synthesis. We hypothesized that transposable element insertions similar to those in 3D1 could contribute to differences in melanization at the species level. We analyzed the presence of transposable elements upstream of Zmr1 in the reference strain IPO323 . Zmr1 had the same protein sequence as 3D1 and 3D7 and, as expected, melanization levels of IPO323 increased with age (Additional file 14A). No transposable element was identified in the immediate vicinity of Zmr1 in IPO323 and the closest transposable element insertion was located 135 kb upstream of the start codon of Zmr1 (Additional file 14). We used Illumina reads from 132 Z. tritici strains from four different global field populations and screened for mutations in the upstream promoter region and the presence of transposable elements upstream of the Zmr1 gene. The amino acid sequence of Zmr1 was highly conserved in all the strains, with an average identity of 99%. Sixty-five percent of the sites in the region upstream of the coding sequence of Zmr1 were polymorphic. Of the 12 SNPs in the Zmr1 promoter in the lighter 3D1 strain, eight were also present in the other analyzed strains of Z. tritici (Additional file 15) and could potentially contribute to variation in melanization levels. Twelve of the strains (including 3D1) had at least one transposable element insertion within 4 kb upstream of the Zmr1 gene. In two additional strains, short scaffold lengths prevented a full screening for the presence of transposable elements. It is likely that all of the identified insertions were the consequence of independent insertion events because they consisted of different types of transposable elements (including a retrotransposon, six DNA transposons, and three unclassified transposable elements) and were located at different positions upstream of Zmr1 (Fig. 8). We selected 11 strains with transposable element insertions and 22 without any insertion upstream of Zmr1 to evaluate the effects of the transposable elements on the regulation of melanin production. Melanin accumulation among these strains was highly variable, with gray values ranging from 91 to 161 at 7 dpi (Fig. 9, Additional files 16 and 17). Insertions of transposable elements had a significant negative effect on melanin accumulation (Fig. 8b, Additional file 16). Furthermore, transposable element insertions negatively affected Zmr1 expression levels (Fig. 8c). These results further support the hypothesis that the transposable element insertion polymorphism affects Zmr1 expression and contributes to the observed phenotypic diversity for melanin accumulation in Z. tritici. Melanin is thought to play an important role in adaptation to changing environments for many fungi. Given its importance, evolution is likely to favor the emergence of genetic mechanisms that enable a variable regulation of melanin accumulation that can balance fitness costs associated with melanin synthesis against the survival advantage that may be gained under hazardous conditions. Here, we demonstrated that differences in regulation of expression of the gene encoding the transcription factor Zmr1 can be governed by both transposable elements and variation in promoter sequences, and contribute to variation in melanization levels. Alterations in regulatory pathways are known to contribute to natural variation in complex traits and differential regulation of gene expression has long been associated with morphological differences among individuals within plant and animal species. For example, selection by maize breeders for a reduction in branching most probably targeted regulatory differences of the gene encoding the transcription factor Teosinte Branched 1, which represses the growth of axillary meristems . In stickleback fish, the differential expression of a bone morphogenetic protein due to a transposon insertion led to changes in the size of armor plates involved in defense . The diversity of wing pigmentation patterns found in fruit fly species is acquired through regulatory changes affecting enzymes involved in pigment deposition [47, 48]. These examples illustrate well the effects of regulatory pathways on complex traits in model plant and animal species. Although several studies suggested that regulatory changes could also play a role in phenotypic variation in fungi, these studies were limited mainly to yeast [49–54]. Much less is known about the importance of regulatory mutations for maintaining phenotypic variation in filamentous fungi [17, 18]. Here we demonstrated a significant effect of variation in cis-regulatory elements on a complex trait in a fungal plant pathogen. Modification of the regulatory sequences of Zmr1 had a major effect on the accumulation of melanin in Z. tritici. Our findings indicate that regulatory modifications can play a major role in fungal adaptation to variable environments. In several recent population genomic analyses of fungi, SNPs significantly associated with a phenotypic trait were identified in non-coding regions of the genome [36, 55]. We hypothesize that these SNPs are involved in modification of regulatory pathways that subsequently lead to the observed phenotypic variation. Melanin is a widely distributed compound in eukaryotes that can affect fitness. The biological functions of melanin differ substantially among species [31, 43, 56, 57]. In plant pathogens, such as Pyricularia grisea, Colletotrichum lindemuthianum, and Colletotrichum lagenarium, melanin accumulation in the appressorium is essential for direct penetration of the host epidermis [42, 58]. Because Z. tritici enters the host through the stomata, melanin is not required to initiate infection. The lack of significant differences in virulence between isogenic melanized and non-melanized strains of Z. tritici suggests that melanin does not play a major role in colonization under the tested conditions. However, we cannot discount a virulence function for melanin under natural conditions, where variation in UV radiation, host genotypes, and interactions with other microbes are likely to play important roles. Z. tritici pycnidia are highly melanized, and melanin likely protects the embedded pycnidiospores. In other organisms, melanin shields against stress  and the degree of melanization can be correlated with the degree of resistance to stress . We found that melanin can lower sensitivity to an SDHI fungicide (Additional file 13), suggesting that frequent applications of SDHI fungicides onto wheat fields may select for strains that can accumulate higher levels of melanin. The capacity of melanin to shield against toxic compounds could reflect a role for melanin in protection against antimicrobials produced under natural conditions by microbial competitors or by the host [43, 60, 61]. The melanin protection we observed against fungicides was specific. The inability of melanin to protect against azoles might be related to the fact that azoles do not bind to melanin, so azoles can reach their target site even in melanized cells . Though melanin can contribute to survival in fluctuating environments, our experiments indicated that melanin production has a fitness cost that results in reduced growth. We found that Z. tritici strains exhibit temporal differences in melanin accumulation. We postulate that these differences reflect selection operating to balance rates of growth with survival to environmental stress. Under this scenario, melanin accumulation illustrates how a trade-off between adaptation and growth can contribute to variation in a trait. Our approach revealed that variability in melanin accumulation is mediated by differential regulation of expression of the Zmr1 gene. Zmr1 encodes a transcription factor that regulates expression levels of genes in the melanin biosynthetic cluster. We characterized two regulatory layers mediating variation in Zmr1 expression: promoter sequence modifications and an insertion of transposable elements upstream of the promoter. Twelve SNPs in the promoter of Zmr1 underlie differential regulation of melanin accumulation in the light and dark strains. Although the individual effects of these 12 mutations have not yet been tested, we hypothesize that at least one of these promoter mutations alters the levels of Zmr1 transcription. An island of 13 transposable elements of approximately 30 kb is located upstream of the Zmr1 promoter in the lighter strain and delays Zmr1 expression. We demonstrated the contribution of the transposable elements in downregulating melanin accumulation by removing the entire transposable element island, which led to an increase in Zmr1 expression and melanin accumulation. The transposable element-mediated downregulation of Zmr1 is transient, as the differences in Zmr1 expression between the lighter and darker strain decrease with age. The transposable element island hinders Zmr1 expression either by blocking the activity of activators upstream of the transposable elements or by epigenetically silencing adjacent regions. Remarkably, we observed a silencing effect of the hygromycin resistance gene under the control of a constitutive promoter when it was located at the Zmr1 locus, downstream of the transposable element island in the 3D1 strain. The expression of the hygromycin resistance gene was higher when it was located ectopically or at the Zmr1 locus in the 3D7 background. These findings suggest that the transposable element insertions reduce the expression of Zmr1 in the lighter strain through epigenetic mechanisms. Transposable elements are frequently associated with heterochromatic regions of the genome and this limits transposable element activity and transcription [40, 63–67]. The spread of the heterochromatic state of the transposable elements to neighboring genes silences their expression, as shown in other organisms [15, 68–71]. Frequently, under stressful conditions, some families of transposable elements are transcriptionally activated [72–74]. This suggests that transposable elements may provide a mechanism to specifically regulate expression of nearby genes under stressful conditions [21, 75, 76]. In Epichloë festucae two genes involved in the synthesis of alkaloids are located in a transposable element-rich region and are epigenetically silenced in axenic culture. Epigenetic silencing and de-silencing were shown to provide an important regulatory layer to specifically produce the alkaloids during host colonization . In the pathogenic fungus Leptosphaeria maculans, effector genes are located in heterochromatic regions rich in transposable elements. 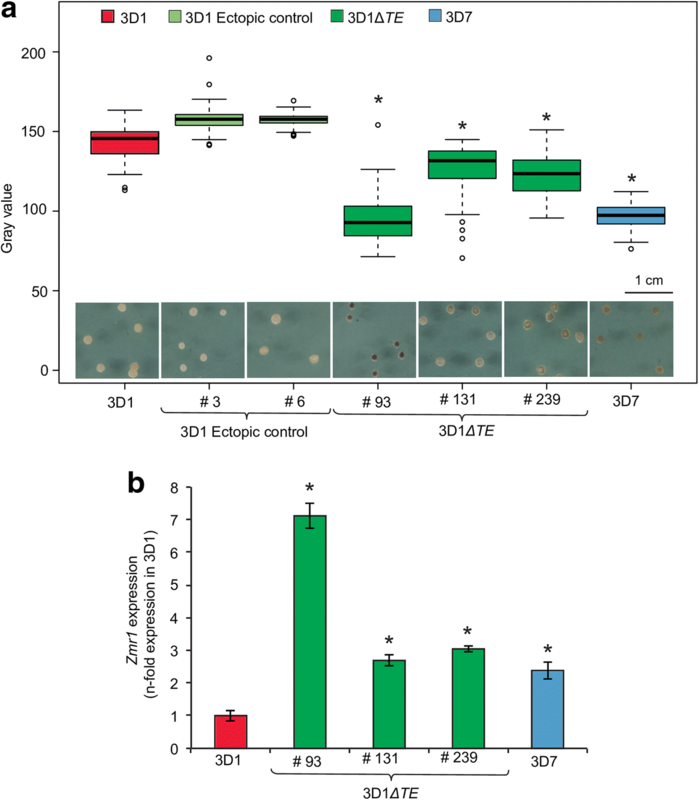 Insertions of transposable elements were shown to modify the epigenetic state of nearby effector genes and consequently modulate their expression patterns . In maize, insertion of a transposable element and the resulting spread of DNA and histone methylation marks to the cis-regulatory region of a gene reduces the accessibility for transcription factors and the RNA polymerase, thus altering expression levels upon attack by Fusarium graminearum . 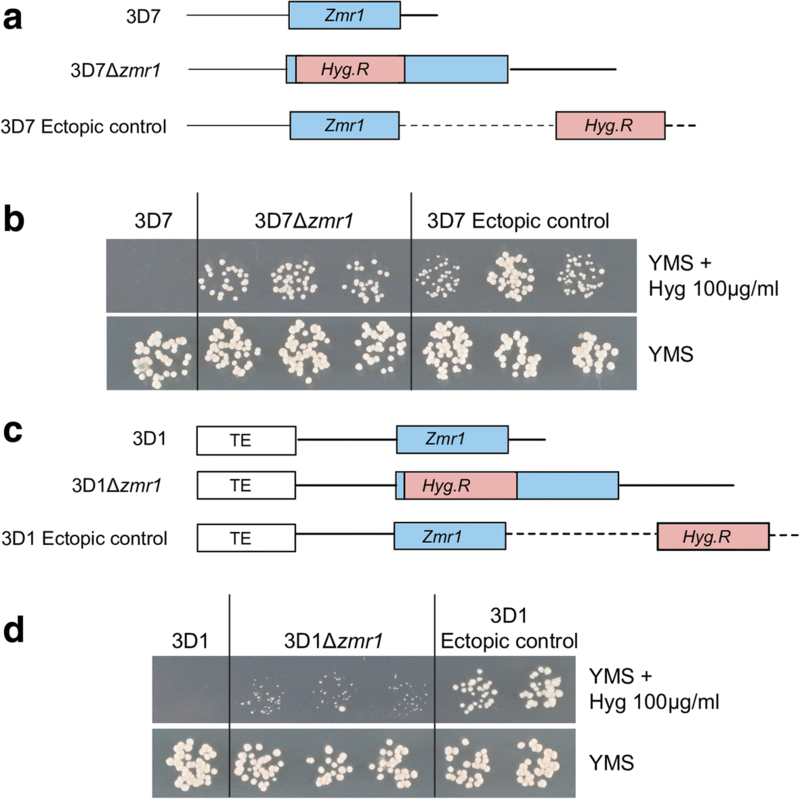 We postulate that regulation of Zmr1 by insertions of transposable elements is mediated by similar mechanisms, which involves the spreading of epigenetic marks to Zmr1 in the lighter strain. In this way, transposable element insertions can provide a new layer of gene regulation that can optimize fitness in fluctuating environments. Two antagonistic consequences of melanin accumulation, protection from stress and decrease in growth rate, suggest the need for variable regulation of melanin synthesis to survive in different environments. During host colonization, Z. tritici is exposed to different micro-climatic conditions and is subjected to environmental changes, depending on its spatial location during host colonization [25, 78]. It is likely that this spatial and temporal environmental heterogeneity leads to diversification of melanization levels in Z. tritici. Fluctuations in macro-climate may also select for diversification in melanization, with episodes of severe heat, cold, drought, or UV radiation likely favoring strains with higher melanization, while less melanized strains may have higher fitness during less stressful weather conditions. The significant variability in the degree of melanization exhibited among different strains of Z. tritici can have many underlying causes, but we hypothesize that most of these differences reflect local adaptation. The genome of Z. tritici contains approximately 17% repetitive elements [39, 69]. Transposable element insertions can cause adaptive variation and contribute to pathogen evolution. Transposable elements are frequently associated with stress-related genes and are considered to contribute to their diversification [22, 23, 76, 79] but how transposable elements drive adaptation remains to be fully understood. Here we show that transposable elements contribute to phenotypic diversity by regulating gene expression. Independent insertions of transposable elements in Z. tritici contributed to differential regulation of Zmr1 expression and led to diversification of melanin accumulation. We demonstrated that diversity in melanin accumulation is determined by differential regulation of gene expression instead of through mutations in coding sequences. Both single nucleotide polymorphisms in the promoter region of the Zmr1 gene and transposable element insertions altered the accumulation of melanin. The complexity at the locus suggests that a sophisticated regulatory mechanism has evolved to balance the trade-offs between growth and melanin production. We believe that variation in transposable element insertions creates differential regulatory patterns through chromatin modification, generating new epialleles. We elucidated how transposable elements can facilitate the diversification of adaptive traits by generating regulatory variation that can regulate fitness-relevant gene expression. 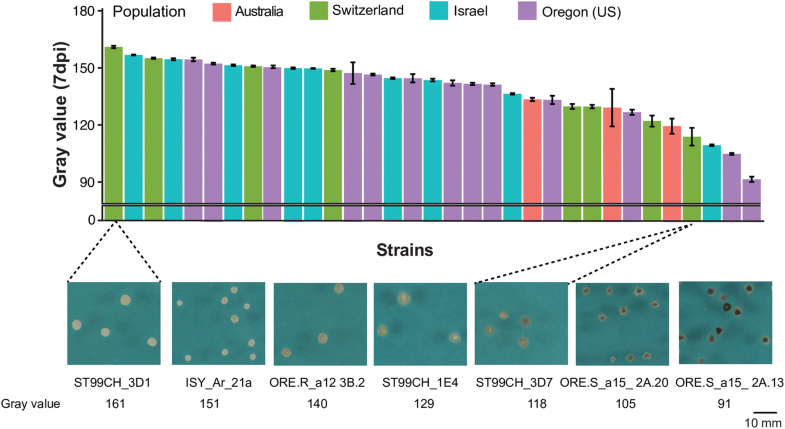 All the Z. tritici strains analyzed in this study, except for IPO323, were previously collected from wheat fields in four different locations: Australia, Israel, Switzerland, and Oregon, USA, during 1990–2001 [36, 80, 81]. The reference strain IPO323 was kindly provided by Gert H.J. Kema (Wageningen University, The Netherlands). The Z. tritici Swiss strains ST99CH_3D1 (abbreviated as 3D1) and ST99CH_3D7 (abbreviated as 3D7) collected in 1999 [33, 82] were used for genetic modifications. Wild-type and genetically modified Z. tritici strains were grown in 50 ml of yeast sucrose broth (YSB, 1% w/v yeast extract, 1% w/v sucrose) with 50 μg/ml kanamycin sulfate in 100-ml Erlenmeyer flasks at 18 °C, 120 rpm for 6 days. Blastospores from the wild-type and genetically modified Z. tritici strains were collected after 6 days of growth in YSB. Liquid cultures were filtered through double-layered sterile cheesecloth and blastospores were collected by centrifugation (3273g, 15 min, 4 °C). The supernatant was discarded; blastospores were washed twice and re-suspended in sterile deionized water and stored on ice until use (0–1 day). The concentrations of the spore suspensions were determined using KOVA® Glasstic® counting chambers (Hycor Biomedical, Inc., USA). Yeast malt sucrose agar (YMS, 0.4% w/v yeast extract, 0.4% w/v malt extract, 0.4% w/v sucrose, 1.5% w/v agar) and potato dextrose agar (PDA) were used for growing Z. tritici strains on Petri plates. Escherichia coli strains NEB® 5-alpha (New England Biolabs) or HST08 (Takara Bio, USA) were used for molecular cloning. E. coli strains were grown on DYT media (1.6% w/v tryptone, 1% w/v yeast extract, 0.5% NaCl) amended with kanamycin sulfate (50 μg/ml) at 37 °C. Agrobacterium tumefaciens strain AGL1 was used for A. tumefaciens-mediated transformation of Z. tritici. A. tumefaciens was grown in DYT media containing kanamycin sulfate (50 μg/ml), carbenicillin (100 μg/ml), and rifampicin (50 μg/ml) at 28 °C, unless stated otherwise. Phenotypic data (gray values of the mapping population at 8 dpi) and restriction site-associated DNA sequencing (RADseq) data from the progeny of the cross between 3D1 and 3D7 described earlier  were used for QTL mapping, using the same protocol described in Meile et al. . QTL re-mapping of chromosome 11 alone was performed in R/qtl version v1.40-8  by simple interval mapping (SIM) analysis as described previously . The degree of melanization in each Z. tritici strain was estimated by plating approximately 100 blastospores on YMS plates. Plates were then randomized and incubated in the dark at 22 °C and 70% humidity. Digital images of the plates were taken through the Petri plate lid at different time points, using standardized settings . Gray value, a proxy for degree of melanization, was estimated for each colony using ImageJ . The gray scale ranges from 0 to 255, where 0 represents the darkest shade of black and 255 represents the lightest shade of white. Gray value of colonies grown on at least three independent Petri plates was measured. Because the 3D7Δzmr1 mutant grew as hyphae instead of as blastospores in YMS (Additional file 18), it was not possible to make a proper evaluation of its growth rate on YMS. Thus, we performed these experiments on PDA, on which both knockouts grew with a morphology that was similar to the wild-type strains (Additional file 18). Colony size was evaluated as previously described at 7–12 dpi . The growth curve for wild-type strains and knockouts was obtained by plotting radial growth (millimeter) over time and fitted to a linear model (Pearson’s correlation coefficient value (r2 value > 0.9)). Growth rate (mm/day) was estimated by calculating the slope of the growth curve. Analysis of covariance (ANCOVA) was performed to determine if there were significant differences in growth rate (p value ≤ 0.05). Significant differences in colony size at each time point (Kruskal-Wallis, ≤ 0.05) were evaluated between Δzmr1 and the wild-type. The experiment was performed three times. To perform fungicide sensitivity assays comparing the wild-type 3D7 and non-melanized 3D7Δzmr1 line, a 100-blastospore suspension was plated on sterile Whatman filter paper, grade 1 (Huber lab), placed on PDA plates. Three plates per strain and condition were incubated in the dark at 22 °C with 70% humidity. After 5 days, the plates were photographed and the filter papers were transferred to PDA plates supplemented with fungicides (0.75 ppm of bixafen or 0.75 ppm of propiconazole, Syngenta, Basel, Switzerland) or control PDA plates without any fungicides. The strains were grown under the same conditions as before and digital images were captured every 24 h until they were 12 days old. The radial growth rates were calculated as described earlier using ImageJ . The percentage decrease in colony radius in the presence of each fungicide was calculated at each time point. The experiment was performed twice. All the amplifications were performed using Phusion high-fidelity DNA polymerase from NEB (Ipswich, MA, USA). Zmr1 disruptant mutants in both 3D1 and 3D7 backgrounds were generated by inserting a hygromycin resistance cassette into the Zmr1 gene 13 base pairs (bp) after the start codon using homologous recombination (Additional file 19). Up-flanking and down-flanking regions (approximately 1000 bp) of the site of integration were PCR-amplified from either 3D1 or 3D7 genomic DNA. A hygromycin resistance cassette with the desired overlap for In-Fusion cloning was amplified from the plasmid pES6 (obtained from Eva Stukenbrock, Kiel University). The flanking regions and the hygromycin resistance cassette were fused to the binary vector backbone of pES1 (obtained from Eva Stukenbrock, Kiel University) in their respective order (Additional file 19) by a single-step In-Fusion reaction (Takara Bio, Mountain View, CA, USA) following the manufacturer’s instructions and then cloned in E. coli. Constructs to generate knockouts of the transposable elements in the 3D1 background were obtained in a similar way, except that these mutants were generated by replacing the transposable elements by the hygromycin resistance cassette (Additional file 19). For generating in locus allele swaps and complementation lines, the full-length Zmr1 gene along with 1863 and 1862 bp upstream of the start codon in 3D7 and 3D1, respectively, and 539 bp downstream of the stop codons were amplified and fused to a geneticin resistance cassette amplified from the pCGEN vector  and the vector backbone of pES1 as described earlier (Additional files 19 and 20). This intermediate construct was used to amplify the full Zmr1 gene fused to the geneticin resistance cassette. Additionally, approximately 1 kb upstream and downstream of the insertion site in 3D7 were amplified and the three amplicons were fused to the binary vector backbone of pES1 as described earlier (Additional files 19 and 20). Mutation-free plasmids were transformed into the A. tumefaciens strain AGL1  by electroporation and screened on DYT medium supplemented with 50 μg/ml rifampicin, 50 μg/ml carbenicillin, and 40 μg/ml kanamycin at 28 °C. A. tumefaciens-mediated transformation of Z. tritici was performed as previously described [83, 88, 89]. Selection of transformants was performed on YMS plates containing 200 μg/ml cefotaxime and the corresponding antibiotic, either hygromycin at 100 μg/ml (Neofroxx, Germany) or geneticin at 150 μg/ml (Thermo Fisher Scientific) at 18 °C for 8–12 days. Individual colonies were then streaked onto YMS plates containing the corresponding antibiotic and grown at 18 °C for 1 week. After one round of selection, single colonies were transferred to YMS plates without a selection agent and transformants were screened for the correct inserts by colony PCR using KAPA3G Plant DNA polymerase (Kapa Biosystem, Massachusetts, USA) and specific primers (Additional file 20). These amplicons were further sequenced (Microsynth AG, Balgach, Switzerland) to confirm the correct integration. The copy number of the transformants was determined by performing quantitative PCR (qPCR) on DNA isolated from transformed Z. tritici strains using Qiagen plant DNeasy kit (Qiagen) and specific primers for the antibiotic resistance marker and for the housekeeping genes TFIIIC1 or 18s rRNA (Additional file 20), as previously described . DNA from wild-type Z. tritici strains without the transgene, DNA from Z. tritici strains harboring a single transgene, and negative water controls were included in all analyses. To test the sensitivity to hygromycin of 3D1Δzmr1 and 3D7Δzmr1, their respective wild-types, and the ectopic controls, 5 μl of 104 spores/ml of 6-day-old blastospores were drop inoculated on YMS media supplemented with hygromycin at 100 μg/ml (Neofroxx, Germany). YMS media without hygromycin was used as a control. Images were taken at 8 dpi. The experiment was repeated three times. RNA sequencing (RNA-seq) analysis was performed to identify differentially expressed genes in wild-type and melanin-deficient Δzmr1 mutants. Roughly 100 blastospores of Z. tritici strains 3D1, 3D1Δzmr1 #6, 3D7, and 3D7Δzmr1 #48 were placed onto PDA plates and incubated at 22 °C in the dark with 70% humidity. After 7 days, individual colonies were picked carefully from the plates using sterile forceps, collected, and frozen in liquid nitrogen. Three independent biological replicates were collected. The colonies were then homogenized using a Bead Ruptor with a cooling unit (Omni International) and zirconium oxide beads (1.4 mm). RNA was extracted using the GENEzol reagent (Geneaid Biotech) following the manufacturer’s recommendations. On column DNAase, treatment was performed using RNeasy mini kit (Qiagen) following the manufacturer’s instructions. RNA-seq was performed on an Illumina HiSeq 2500 using paired-end reads at 2 × 101 bp as previously described . Raw RNA-seq reads were trimmed using Trimmomatic v. 0.33 . Trimmed reads were aligned to the Z. tritici parental genome 3D7 or 3D1 and transcriptome using TopHat v 2.0.13 . Gene counts were calculated using HTSeq v0.6.1  and differential gene expression analysis was performed using the R package EdgeR version 3.2.3 . Relative RNA levels in the RNA-seq experiment were calculated by TMM (trimmed mean of M values) normalization . Mean TMM-normalized log2 CPM (counts per million mapped reads) were calculated for all the annotated genes. To identify differentially expressed genes between a wild-type strain and melanin-deficient Δzmr1 knockouts, Benjamin-Hochberg false discovery rates (FDR) and an FDR-adjusted p value were calculated. The RNAseq was deposited in SRA database with the accession number SRP143580 (https://0-www-ncbi-nlm-nih-gov.brum.beds.ac.uk/sra/SRP143580). Expression levels of Zmr1 in different Z. tritici strains and genetically modified strains were quantified using qRT-PCR. RNA was extracted from Z. tritici strains grown in vitro and harvested at 7 or 9 dpi depending on the experiment, as described earlier for the RNA-seq analysis. cDNA was synthesized from 500 ng of RNA using oligo(dT)18 primers and Revert Aid RT Reverse Transcription kit (Thermo Scientific) following the supplier’s instructions. qRT-PCR analysis was performed using a 10-μl reaction mix with 1 μl of cDNA. A negative control with RNA alone and water was also included. Specific primers spanning introns were designed for the targets Zmr1 and 18S ribosomal RNA to avoid the risk of genomic DNA contamination (Additional file 20). Crossing point (Cp) values were calculated using absolute quantification and the second derivative method provided by LightCycler 480 software version 1.5 (Roche Diagnostics Corp., Indianapolis, IN, USA). “Advanced Relative Quantification” method was used to analyze the fold change in expression of Zmr1 when compared to the wild-type strains. Advanced Relative Quantification method was also used for estimating the fold change in expression of Zmr1 in different strains of Z. tritici compared to 3D1. The Z. tritici wild-type 3D7 strain and three independent 3D7Δzmr1 mutants lacking melanin were compared for their ability to infect the winter wheat (Triticum aestivum) variety Drifter (DSP Ltd., Delley, Switzerland). Two wheat seeds were sown in peat soil (Jiffy GO PP7, Tref, Moerdijk, The Netherlands) in 7 × 7 × 9-cm plastic pots and grown in a greenhouse at 18 °C day and 15 °C night, with a 16-h light cycle and 70% relative humidity. Plants were fertilized 10 days after sowing with 10 ml 0.1% Wuxal Universaldünger (Maag AG, Switzerland) per pot. Twelve 17-day-old seedlings were spray-inoculated with 15 ml of a blastospore suspension (106 spores/ml) containing 0.1% (v/v) of Tween 20 (Sigma Aldrich). Pots were placed under 100% humidity for 3 days by covering them with a plastic bag. The second leaf of each plant was collected at 21 dpi and pycnidia density (pycnidia/cm2 leaf) and percentage of leaf area covered by lesions (PLACL) was analyzed using automated image analysis which was manually verified . For Z. tritici strains IPO323, 3D1, 3D7, 1E4, and 1A5, full genome annotations were already available [39, 44, 95]. Synteny of the QTL between IPO323, 3D1 and 3D7 was analyzed using blastn and visualized using the R package genoPlotR v.0.8.4 . We annotated and masked repetitive elements for the remaining 128 Z. tritici strains using RepeatModeler version 1.0.8 as described earlier [39, 82]. Whole-genome Illumina sequencing data from the 128 strains was obtained from the NCBI Short Read Archive under BioProject ID numbers PRJNA178194 and PRJNA327615 [55, 97–99]. We masked the genomes using RepeatMasker version 4.0.5 with the library previously obtained for Z. tritici strain IPO323  according to the transposable element nomenclature defined by Wicker et al. . Multiple sequence alignment of Zmr1 in the Z. tritici strains was performed using AliView version 1.22 . Amino acid sequence identity of Zmr1 in the Z. tritici strains was calculated using the Sequence Identities and Similarities (SIAS) . Data analyses and plotting were performed using R version 3.3.1 and RStudio version 1.0.143 [103, 104] and Microsoft Excel. The non-parametric Kruskal-Wallis test was used to compare gray values between different strains/groups, since the data sets do not follow a normal distribution. Tukey’s HSD test was used to estimate significant differences in pycnidial density between different Z. tritici strains for the in planta virulence assay. ANCOVA analysis was performed to determine significant differences in growth rates of Δzmr1 mutants and the respective wild-type. Number of replicates and sizes of the samples are indicated in Additional file 21 and in the tables that show the results of the experiments. Data were represented using bar plots showing mean values and standard errors of the mean and boxplots. RNA sequencing was performed at the quantitative genomics facility of the D-BSSE, ETH Zurich. qPCR was performed at the Genetic Diversity Centre (GDC), ETH Zurich. Technical assistance was provided by Lotta Köppel. Eva H. Stukenbrock and Jason J. Rudd provided us with vectors and Gert H.J. Kema with IPO323 strain. The research was supported by the Swiss National Science Foundation (grant 31003A_155955, http://www.snf.ch/en/Pages/default.aspx.) and by the ETH Zurich Research Commission (grant 12-03, https://www.ethz.ch/en/research/research-promotion/eth-internal-programmes/eth-grants.html) to BAM. PK was supported by the Swiss State Secretariat under the Education Research and Innovation, through the Federal Commission for Scholarships for Foreign Students. CP was supported by an INRA Young Scientist grant. DC is supported by the Swiss National Science Foundation (grant 31003A_173265, http://www.snf.ch/en/Pages/default.aspx). The funders had no role in the design of the study, data collection, analysis and interpretation of data, and in writing the manuscript. The datasets generated and analyzed during the current study are available in the SRA database (accession number: SRP143580), https://0-www-ncbi-nlm-nih-gov.brum.beds.ac.uk/sra/SRP143580. PK contributed to the conception and design of the analysis, acquisition of data, analysis of the data, and writing of the original draft of the manuscript. LM contributed to the design of the analysis and acquisition of data and contributed to the edition and revision of the manuscript. XM analyzed the RNAseq data and contributed to the edition of the manuscript. CP contributed to the analysis of the transposable elements in the populations. FEH contributed to the bioinformatics analysis of transposable element variation in the populations and edited the manuscript. DC contributed to the analysis of the transposable elements in the populations and edited and reviewed the manuscript. BAM acquired funding and reviewed the manuscript. ASV contributed to the conception and design of the analysis, supervision and analysis of the data, and writing of the manuscript. All authors read and approved the final manuscript. Meile L, Brunner PC, Plissonneau C, Hartmann FE, BA MD, Sánchez-Vallet A. A fungal avirulence factor encoded in a highly plastic genomic region triggers partial resistance to septoria tritici blotch. New Phytol. 2018. https://doi.org/10.1111/nph.15180. Rech P. SIAS: sequence identities and similarities. 2008. Available from: http://imed.med.ucm.es/Tools/sias.html. Accessed 26 June 2018. RStudio. Boston, MA; 2012. Available from: http://www.rstudio.org/. Accessed 26 June 2018. R Core Team. R: a language and environment for statistical computing. Vienna, Austria: R Foundation for Statistical Computing; 2013. Available from: http://www.r-project.org/. Accessed 26 June 2018.